Hah — snow fell from West Virginia to western New York on April 23, when we were thankfully receiving rain! How much risk to take, regarding assumption of early spring equaling no more frosts? This unusual spring has pushed the island of Martha’s Vineyard along between two to three weeks earlier than is the norm. Whatever “the norm” may have been in the past is irrelevant for the future. The many Magnolias thrill (unless frosted) and give the owners of the landscapes in which they appear much pleasure. Their Island season extends from March through summer if one counts the intermittent, later flowers of the evergreen M. grandiflora and semi-evergreen M. virginiana. 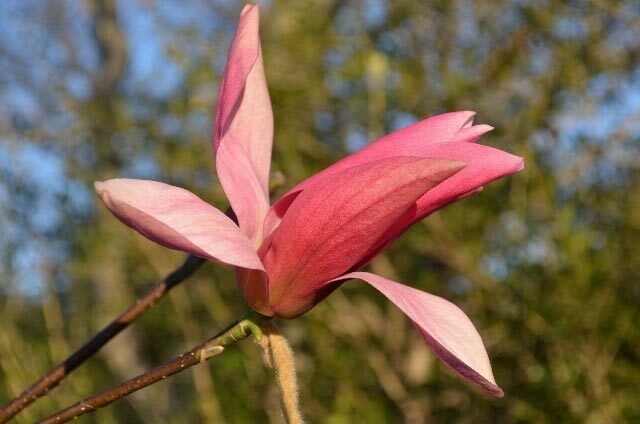 For many of us, magnolias are symbolized by the Magnolia x soulangeana hybrids, known as “tulip trees” in the South and around here as “saucer magnolias.” The flowers, ranging from near white through pink, peachy, plummy to purple, and wine red, do resemble over-large tulips. Today’s saucer magnolias have been drawn from a wider ancestry than the original soulangeana crosses, which were M. denudata x M. liliiflora. The Polly Hill Arboretum’s (PHA) stunning, recently planted specimen, M. ‘Daybreak,’ comes from the breeding work of the late August E. Kehr, plant researcher and hybridizer. According to the Holden Arboretum (Ohio) website, he used several cultivars and M. acuminata, the native cucumber tree, to produce the spectacular newcomer. Among ‘Daybreak’s’ attributes is luscious flower color. As can be seen from the image, the outside of the tepals is a warm, pastel pink, the inside a paler blush pink. Flowers may be as large as eight to ten inches in diameter; coming as they do toward the end of April frost damage is unlikely. The fragrance is described as wonderful, neither too sweet nor too strong. As I mentioned above, many gardeners are weighing the pros and cons of getting a jump on the season by early planting-out, with caution and Hotkaps part of the equation. The Community Solar Greenhouse (COMSOG) has been hard at work, according to Thalia Scanlan, COMSOG head honcho and the Island’s Tomato Queen. The Community Solar Greenhouse (COMSOG) holds its Mother’s Day Plant and Seedling Sale beginning Saturday, May 12 and 13, from 9 am to 2 pm, and continuing all month. Over 35 varieties of heirloom tomatoes, peppers, eggplants, plus herbs, flowers, other veggie seedlings and lovely hanging baskets! A great Island tradition! Location: 114 New York Ave., Oak Bluffs. Arrive early for the best selection, and while you are there, support this outstanding Island organization by becoming a member. I was recently on the mainland and observed with sadness throughout southeastern Massachusetts and the Boston suburbs the almost-religious observance of the mulch volcano ritual. It makes me sad because this useless and harmful practice is creeping into Island landscapes as well. Please, PLEASE do not equate lovingly heaping shredded mulch around the trunks of your trees with good tree care! Mulching trees, shrubs, and beds is indeed a good practice, and conserves moisture, but the mulch should not come into contact with the trunk. Pull it away so the bark can breathe. The root flare should be visible. This, about the root flare, also holds true if you are planting a tree this spring. Dig the hole not so much deep as wide. Use the shovel handle as a ruler to get a rough measure from the base of the root ball or container to the root flare. Then dig to that depth. Spread out the roots as well as you can, balancing the root ball on a small mound or clod of soil. Now lay the shovel handle across the hole with the tree in it. The root flare should be at the level of the handle. If it is below the handle, add more soil under the root ball to bring the root flare level with or just above the handle. Pay attention to this: most tree failures are from too-deep planting. Then form a watering well by heaping up soil around the edges of the planting hole. Getting going in the garden in spring involves many different areas of effort. One is a final cleaning out around bushes and shrubberies, and under hedges. Hedges provide fine cover for many birds but their droppings will inevitably contain seeds of the fruits and berries they eat, resulting in unwanted plants gaining a foothold within the hedge. Wind-blown seeding also takes place. In the case of Japanese honeysuckle, autumn clematis, or bittersweet, it may be worse than loss of visual uniformity, as these vines grow faster and outweigh the plants upon which they grow, eventually pulling over the hedge or leaping from it onto taller, nearby trees. In the case of all weedy invasives, including sycamore maples, barberry, Morrow’s honeysuckle, multiflora rose, autumn olive, or burning bush euonymus, removal is relatively easy when small, but a really tough job after a season’s rapid growth.